As you learned in the last segment, the human brain is capable of doing amazing things, but can really fall flat when it comes to recalling information when it needs to. The reason that these mental recollections are triggered at the wrong time is simply due to the lack of a proper system. 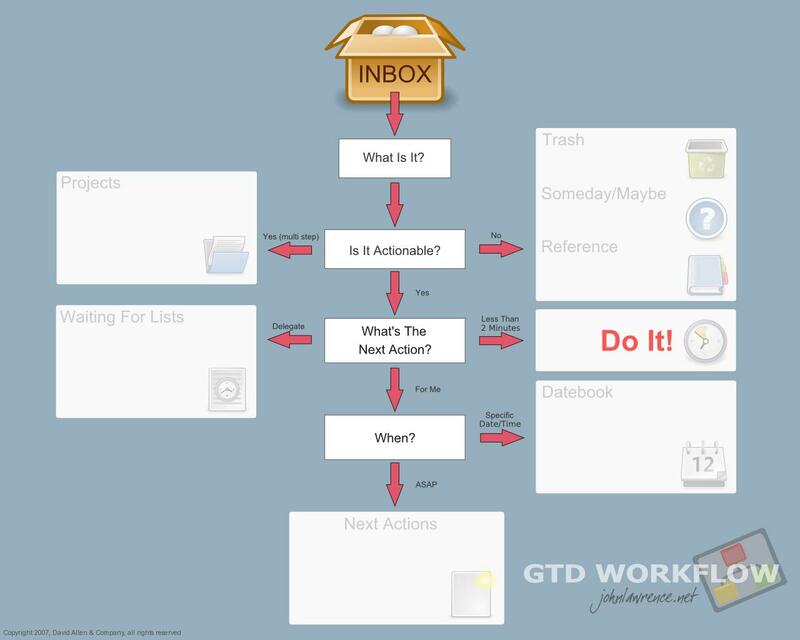 With GTD you will learn how to remember the right item when you need it (that is, when you can actually do something about it). You don’t need to remember your presentation at 3:30 in the morning—you need to remember it as you head out the door. Not only does Getting Things Done help you remember things when you need to, the productivity system is built around keeping a “to-do” list based on context—Getting Things Done creator David Allen calls these action items. By context I simply mean where do you need to be to take that action and when is the best time to do it. Do you have to complete the action at your office? At your home? Does it require a phone or an in-person meeting? Those are all contexts. It’s important to note that with Getting Things Done you create your own context items to suit your life and your needs. Some example of a context may be: Home, Work, Computer, Call, and Wait. By sorting your things to do (your actions) into these contexts, you can start to organize yourself. For example if you need to set a reservation for your anniversary dinner, you will need to be on the phone so your context will be “call”. If you need to check your bank balance you may have to do it online so it will be a “computer” context. By sorting your actions into context, you can take care of all of the items within that context at once. If you are at home and are planning on making a call, you can make all of your home calls at once so you are more effective. By having your actions placed in terms of context, you will be a lot more flexible and be able to maximize what time you have during changes in plans. Imagine you were supposed to go to a meeting for 1 hour but the meeting was canceled. Instead of wasting that hour, you could bring up your action list that required a computer and do everything in that context all at once. Because you will know exactly what you can and can’t do in your current context there will be no reason to worry unnecessarily. If you are driving down the road you know you can’t do items in your “home” context so there’s no reason to stress about it. In our next segment we will start to cover how action items are placed in your Getting Things Done system. Thank you. I am glad that this article was able to help you. Stay tuned for more on getting things done. I’ve tried it and found that I don’t have the habit of checking my task list by context (even when I organize it that way), but when I do, it’s effective.